This unusual surname is of Anglo-Saxon origin, and is a locational name from any of the several places called Harrop in the West Riding of Yorkshire, or from Harrop in Cheshire, all of which derive from the Olde English pre 7th Century "hara" meaning hare, plus "hop", valley. During the Middle Ages when it was increasingly common for people to migrate from their birthplace to seek work further afield, the custom developed that they would adopt the placename as a means of identification. The surname dates back to the late 12th Century (see below), and early recordings include William de Harrope (1242) in the Assize Court Rolls of Durham, and William Harrop (1367) in the Feet of Fines of Yorkshire. 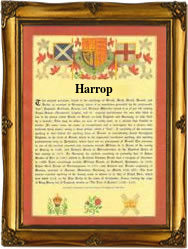 Variations in the spelling of the surname include Harrup, Harrap, and Harop. Church Records list the christenings of Willyam Harop, on December 6th 1551 in Ingleby Greenhow, Yorkshire, and of Edmondus, son of Johns Harrope, on March 31st 1593, in Whitgift, Yorkshire. Roger, son of John Harrop, was christened on October 24th 1602 at Holy Trinity the Less, London. The first recorded spelling of the family name is shown to be that of Richard de Harop, which was dated 1185, in the "Pipe Rolls of Northumberland", during the reign of King Henry 11, known as "The Builder of Churches", 1154 - 1189. Surnames became necessary when governments introduced personal taxation. In England this was known as Poll Tax. Throughout the centuries, surnames in every country have continued to "develop" often leading to astonishing variants of the original spelling.